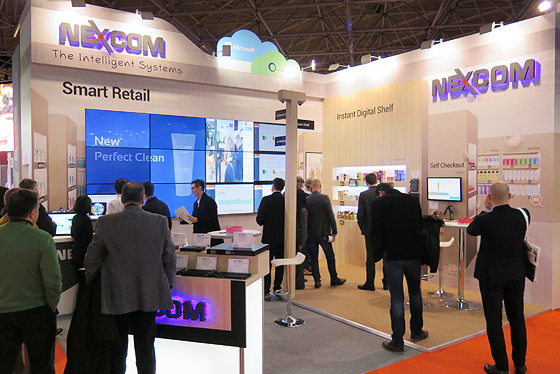 NEXCOM smart retail solution, integrating several technologies by its versatile digital signage players, had gain wide popularity among worldwide visitors at the 2017 Integrated Systems Europe (ISE) exhibition. The most popular applications are smart shelves and audience analysis, astonishing visitors with interactive experience, reshaping the value of shops and boosting sales. The smart shelf gathered the utmost interest from visitors. In the booth, visitors could pick up any commodities from the shelf which was detected by Intel® Retail Sensor technology to link NEXCOM digital signage player NDiS B535 controlling electronic shelf labels to show dynamic pricing as well as simultaneously delivering relevant ads. Featuring 6th generation Intel® Core™ processor, NEXCOM digital signage player NDiS B535 is outfitted for smart retail reaching out to customers through personalized in-store offers, providing retailers with valuable information to optimize shelf assortment and ultimately increase in-store sales. The audience analysis, driven by NEXCOM digital signage player NDiS B8C6, is one of the most sought-after as it showcased how it utilizes Quividi facial recognition technology to evaluate demographics, by playing specific content to engage visitors. Equipped with 12 HDMI display outputs, it displayed images and videos stretched seamlessly across a twelve-display video wall. The digital signage player NDiS B8C6 is an advanced media player for any applications to showcase high-quality and high-impact content over multiple displays. For more information about NEXCOM smart retail solutions, please contact NEXCOM's sales representatives.